We have a little farm shop on site, which offers a wide selection of fruit and vegetables. 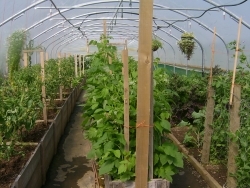 We have a polytunnel and try to grow a lot of our own. We use local suppliers and farmers for other vegetables. We sell Beatons Eggs which are beautiful and lovely Free range eggs. We sell a range of potatoes from a local grower. The varieties at present are Roosters, Maris Piper and Kerrs Pink. Charles is busy planting new tatties in the polytunnel for the summer. We stock Ola oils and marinades. They have an excellent range of flavoured oils which enhance your cooking. The lemon oil is great for cooking fish and the garlic , basil and rosemary flavoured oils have many uses. There is a selection of Fair trade goods in the shop. We also make a large range of Home made Jams and Jellies in the shop. There is a wide variety of flavours and combinations to choose from. The new seasons marmalade is now in stock. If Chutneys are your thing, there are some delicious flavours to choose from. Please visit soon and shop is open on site for all your fruit and veg needs. Website developed by ABZ Computers, Ellon, Aberdeenshire.